TMCnet, a global, integrated media company helping clients build communities in print, in person and online, announced that the Wholesale VoIP channel, sponsored by ABG Capital portfolio company, VoIP Innovations, has been launched as the newest addition to the TMCnet Online Community program. 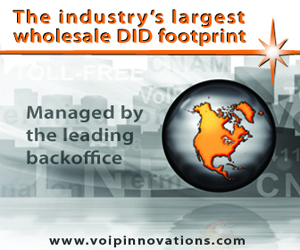 VoIP Innovations is a wholesale VoIP origination and termination carrier for over 1000 ITSPs, Hosted PBX providers, call centers, calling card providers and carriers. Specializing in providing the largest DID and termination VoIP footprints in North America, the company has played a central role in the growing world of VoIP for over 10 years. Boasting the experience, extensive network and dedicated staff, VoIP Innovations has been bringing its customers’ businesses to new, sophisticated levels to achieve a strong competitive edge. Additionally, the company offers the nation’s largest telecom providers with the most affordable and efficient wholesale VoIP rates and network footprint needed to remain competitive, such as its proprietary Titanium III platform, which enables customers to deploy VoIP services in real-time via their cloud service. This entry was posted in Business Development, business management, corporations, Entrepreneur, financial services, investment, small business, Telecommunications, Wholesale VoIP and tagged business, business development, business management company, entreprenuership, investment, small business, wholesale DIDs, wholesale origination, wholesale termination, wholesale voip, wholesale voip provider by ABG Marketing. Bookmark the permalink. Wow, awesome blog layout! How long have you been blogging for? you made blogging look easy. The overall look of your site is fantastic, as well as the content!. Thanks For Your article about ABG Capital Portfolio Company, VoIP Innovations, Launches Wholesale VoIP Channel on TMCnet | ABG Capital& .